comfortable place between her friends in the Watch and her friends in the district who are thieves and entertainers -- for her own safety. Beka is resentful that she's being sent to Port Caynn to investigate something as simple as counterfeit coins, but it turns out that not only is there a hunky man to keep her occupied, the investigation heats up all around her. Her "puppy" skills of sinking her teeth into a case and not letting go are crucial, and fans of the series will enjoy watching Beka's Dog skills go Bloodhound, as she and her senior partner do a bit of sleuthing. 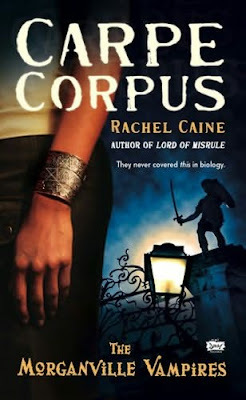 Carpe Corpus (Morganville Vampires, Book 6), by Rachel Caine, is another book that I've struggled to get into. Fortunately, since I don't have time to read the previous five volumes, the premise is simple enough: Morganville was doing just fine as a Human/Vampire city, under the auspices of the vampire Amelie, who had marked Claire Danvers as one of her own, to be treated with special care, as a loyal human. Not everyone liked it, but it was...workable. Except that Amelie was overthrown by a bloodthirsty vampire called Bishop. Now her boyfriend and his father, vampire hunters, are held captive, and Morganville is under the thumb of a bloodthirsty, vicious despot. Claire would do anything to save her boyfriend Shane, up to and including begging Bishop for his life, and further gaining the hatred of the townspeople by serving as his errand girl and notifying the townspeople of their status as prey. Amelie's got a plan -- but after all the power plays and bloodshed, it's improbable that Morganville is going to ever be the same. 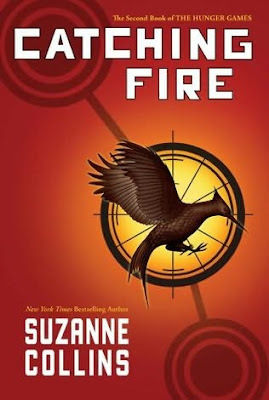 Catching Fire (The Second Book of the Hunger Games), by Suzanne Collins, is not a stand-alone either, and readers will step right into the turbulent tale that left off in Book 1. The Capitol is still insane, Peeta and Gale are still the boys Katniss' mind, and President Snow is still scary as heck. Nothing much has changed, even though Katniss is a Hunger Games victor. She's still uneasy, and in a few pages, you'll see that she was right to be. As usual, there are a plethora of choices in front of her, and she doesn't make the right choice at every turn, but oh -- reading the book is a can't-put-it-down, heart-pounding adventure. Have been looking forward to this one! Recently The Spectacle recently had a two part discussion of this book -- it contains spoilers, be warned, but it's always fun to read what authors think about a popular series. There are tons more sequels, but these are the ones I've gotten to thus far. Check out some of the earlier books in the series, and enjoy! Bloodhound, as well as Carpe Corpus, and Catching Fire, all 2009 Cybils YA SFF Nominated Books, from an independent bookstore near you! 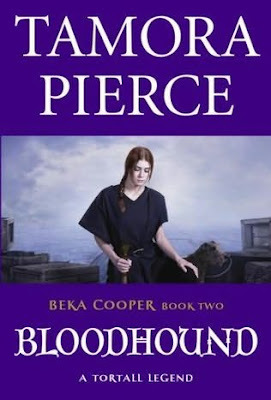 I can't wait to read Bloodhound. Argh. If I weren't out of the country, I'd so be on that SFF panel with you!! The Hunger Games and Catching Fire are great! Last year we had the fourth Percy Jackson book on our Cybils sff list. It was one of the ones I didn't read, because (oh the shame) I have not read any of them. This year we have the fifth. But I am going to read them all this time...it makes a difference that we have less than 100 total, now that mg has been split off from YA. As opposed to 161 last year, when they were together. Eric: At the end of Catching Fire I rolled around and screamed and wept tiny, bitter tears of rage and frustration. I may die waiting for the next book. It is THAT bad. Charlotte: I've only read the first one; I'm pretty sure that the tension has ratcheted right up as Percy ages and as things get more serious. That's another series I'll have to make time for to read all in one go. Is Percy Jackson the series by Rick Riordan? I remember I didn't get to that one either, when I was on the SFF panel, for the same reasons. But I hope to have time to start that series from the beginning--I've heard good things. Catching Fire is still waiting patiently for me on the shelf because I want to re read Hunger Games just before I read it. I love Percy Jackson. So do my daughter and her buddy. Yep the Percy Jackson series is by Riordan. I really, *really* have to sit down with the whole thing. Eventually.